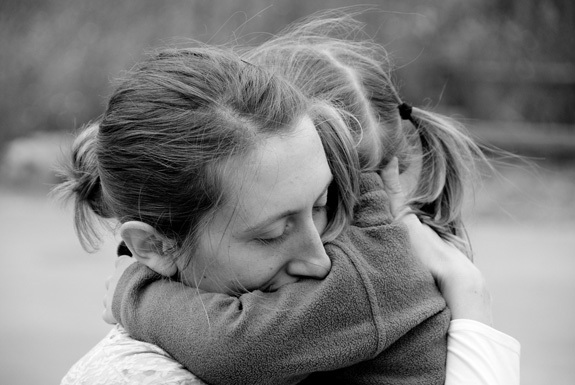 Years from now, I’m certain we will look back on this year as a turning point for our family. We knew 2011 would be one of the most exciting, challenging and memorable years on record. It did not disappoint in that regard. Instead it left us with an appreciation for all we have and the support we enjoy from our family, friends and colleagues. If you’ll indulge us, we would like to give you a recap of 2011 for the Pritchard family. Carson came into our lives just two weeks before Christmas 2010. The holiday season was a blur of Christmas lights and sleepless nights. We emerged on the other side of the New Year with a smiling bundle who soon earned the name Captain Smiles. Carson is a happy kid, but is certainly not afraid to speak his mind when the situation calls for it (feed me, burp me, amuse me). In February, Carson took his first trip to Portland to meet family and friends and deemed the state of Oregon: “A fine territory, rich in natural resources and worthy of further exploration.” A few months later, Carson spent his first night in a tent on Grandpa’s back lawn in Twain Harte. The close quarters didn’t suit him at the time, but we’ve had two camping trips since and he’s warmed to the idea of sleeping beneath the stars. Carson spends three days a week in the loving company of our nanny Ahna and his best bud, Naomi Sabraw. In November, he watched his first OSU football game and was welcomed into the brotherhood of the damned. 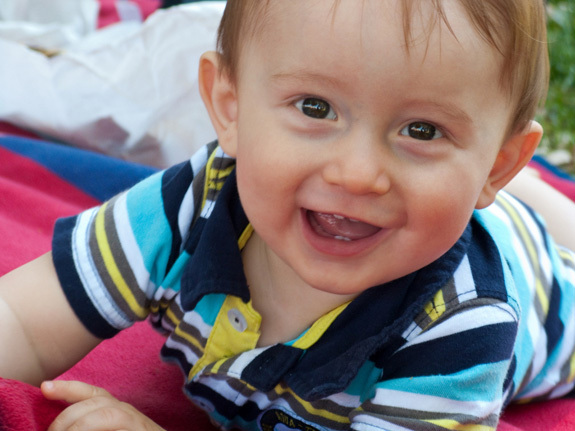 We shook that one off and celebrated his first birthday earlier this month with family and close friends. Carson becomes more mobile every day. He’s pulls himself up on anything in sight and teeters around on his squishy little feet. It won’t be long before we’re running after him, just trying to keep up. Autumn has eased her way into Big Sister mode with equal parts curiosity and mild discontent. 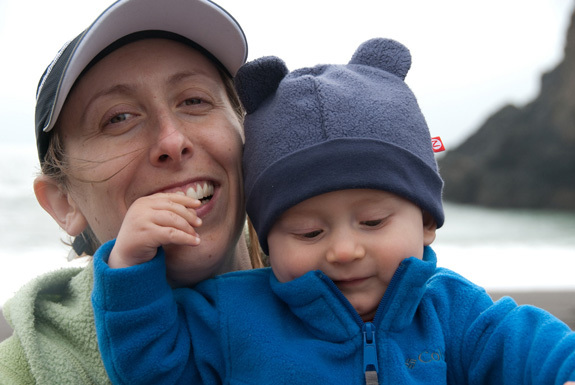 “Who is this diapered interloper in our midst?” (Yes, our kids really talk like this.) She’s become a champion road-tripper and declares a clear preference in music: Hip Hop. She loves to read books with Mom and Dad, and her favorites include: Ferdinand, Learning to Ski with Mr. Magee and The Country Bunny and the Little Gold Shoes. 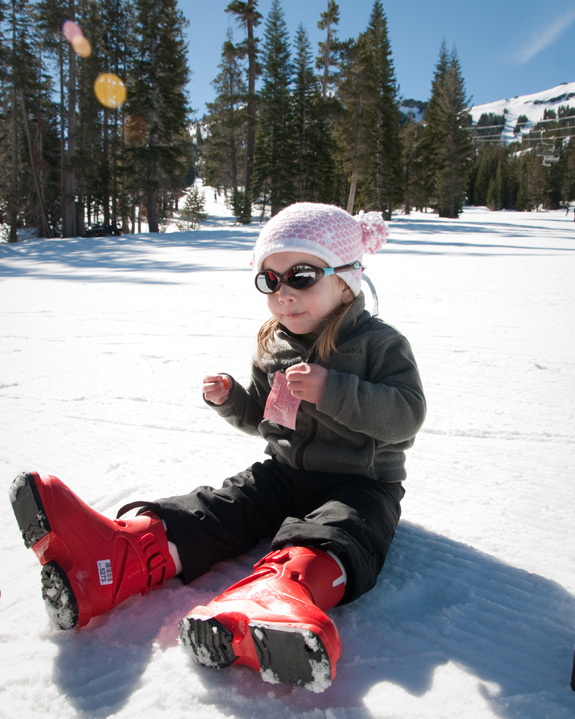 In February, Autumn stepped into ski boots at Kirkwood for the first time and declared: “Ahh…now this is civilized,” then proceeded to give a sharp look to the knuckle dragging masses cinching up their snowboard bindings. We kept our expectations low and our supply of M&Ms flush (don’t judge us) and made it through the first ski experience with everyone’s feelings intact. Autumn loves her weekly swimming lessons at the JCC and also gave soccer a try this past summer (ehh…we’ll keep working on that one). In September, Autumn said goodbye to the droolers at daycare and matriculated at Presidio Preschool. She loves going every Tuesday and Thursday and spends most of her time at PPS working on art projects, a pursuit to which she also devotes much of her time at home. In November, she had a surprise visit from the Tooth Fairy after a little swimming pool accident brought a bit more character to her smile. Autumn loves to laugh and dance and has become a capable sous chef, helping Dad with cooking projects nearly every weekend. She has the pancake recipe down pat – three of everything (see the video). Jody took a major step this year in her professional life. 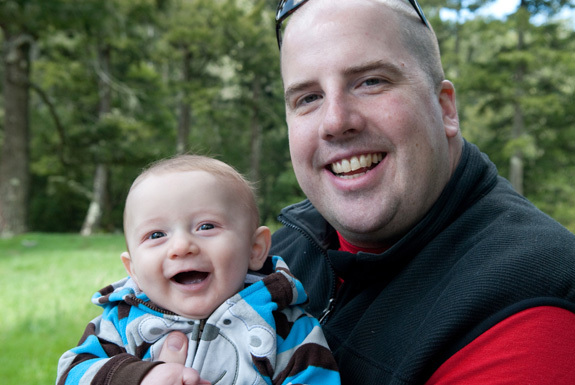 In January, just weeks after Carson was born, Jody founded Pritchard Lighting Group. Starting with just one project that she carried over from her previous company, a steady stream of work began to flow in. Before long, it was clear that the plan for several months of rest was a pleasant memory. Plumbing the depths of sleep deprivation, Jody worked tirelessly to build a solid foundation for her new business. Jody Pritchard and Kristin Peck founded PritchardPeck Lighting in 2011, intent on building a team of talented professionals who seek to elevate the practice and deliver a fresh and accessible perspective on lighting design. A creative approach to problem solving is combined with a strong aptitude for technology. This is a team with the curiosity to push the boundaries, and the experience to deliver something both practical and beautiful. Fearing the title of Overachiever of the Year might escape her grasp, Jody continues to stay home with the kids two days a week, taking them to swimming lessons, the Discovery Museum and plenty of time at the neighborhood parks. Often, her work gets in where it fits in and she’s become acquainted all too well with the other side of midnight. Matt is still uncomfortable talking about himself in the third-person but has acquiesced to the tradition of the holiday letter. In 2011, Matt saw his responsibilities grow in his role at Williams-Sonoma, where he works on strategy and new features for the eCommerce platform. If you spent any time on the Williams-Sonoma, PotteryBarn or West Elm websites in the past year, you’re already familiar with his work. In his limited spare time, Matt let his geek flag fly with a renewed interest in high-power rocketry and various tech hobbies. He still bakes and makes photographs whenever time permits, opportunities that are few and far between these days. At the end of the day, most of his time is spent trying to impress his kids with fresh dance moves. 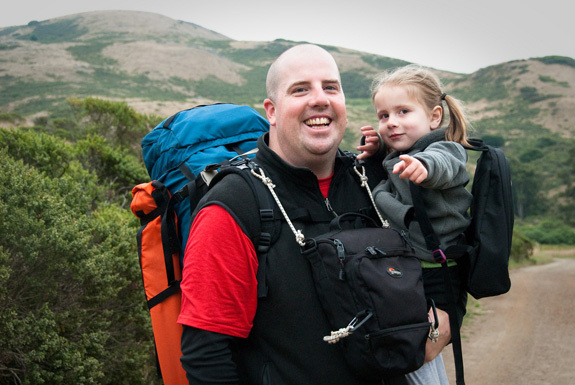 Perhaps Matt’s greatest achievement this year was getting his young family out the door for three camping trips, including one bona fide backpacking trip in the Marin Headlands. Each trip was designed to allow for mid-night bailouts in the event of a blowout, meltdown or raccoon attack. 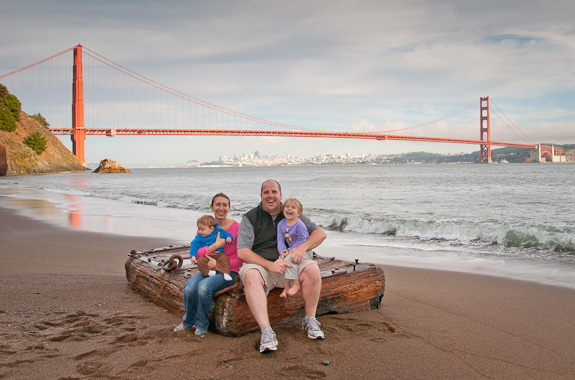 The most memorable trip was likely our October trip to Kirby Cove, where we got to spend the night at the beach beneath the Golden Gate Bridge and just a stone’s throw across the water from our home on 25th Ave. Both kids got their first view of Yosemite Valley during a weekend trip in May, and were greeted by the biggest waterfall flow in a generation. In October, the crew headed south for a much-needed vacation in Palm Springs. A week of swimming, relaxing and exploring the Coachella Valley was capped off with a day trip to Joshua Tree National Park. After Christmas, the team will head south for bit of adventure in the wilds of Death Valley National Park and the Eastern Sierra playground they like to think of as their second home. 2011 has been an amazing year. We’re happy to have spent time with so many of you and look forward to a timely reunion with so many more. We hope you have a Happy Holiday season and a prosperous New Year in 2012. Take Care. WOW — What a great year this has been for all of you !! It is really hard to believe that you packed all these family events and professional advances into just 365 days. It is a good thing that you are going to have an extra day next year! Thanks so much for taking the time to document, with great pictures and written text, your amazing year as well as the growth of your two wonderful children so it can be shared with others. Nicely done Pritchard clan. In Tahoe right now enjoying zero snow but bluebird skies. Will be over hiking at Carson’s namesake pass tomorrow. So sweet! Happy holidays to all the Pritchards. LOVE the three theme–sounds very Trinitarian, by the way. Just wish I had caught the Easter morn reference to Jesus in the last frames. How did that theology go? Next time we make pancakes, I am going online to translate your recipe of threes! Looking forward to it. Hope the East side is awesome! Much love!